During the Thirties, the Factory enjoyed great prosperity and renown, reaching, in 1934, a maximum of 117 people employed with a waiting list of 338. It was not, at that time, a charity as we know it today but “a self help movement run on strict business lines. No doles are given, the employees being paid by results”. Not everyone worked in the factory as there were, at various times, up to three shops in Edinburgh for the sale of handicrafts and a travelling shop which drove all round Scotland averaging £100 per week in sales. Artefacts, in addition to soft toys, included leather goods, artificial flowers, rocking horses, dolls’ houses, tin soldiers, lampshades, black rose bowls, electric lamp standards and, later, woven goods. Special orders for Jubilee and Coronation decorations were fulfilled and, within reason, almost anything else could be made to order. In 1931, new premises for sales were opened at Marryat House in Calton Road thanks to a bequest from Mrs Marryat, sister of Sir James Caird Bt of Dundee. During the rest of the decade, the Factory was visited by the Prince of Wales (1932) and the Duke and Duchess of York (1933) while the travelling shop called at Balmoral every year. In 1937, the new Queen Elizabeth called in at the shop in George Street. By now, the Factory had a Council, a Committee of Management and a Ladies Committee chaired by Lady Haig herself. Both she and Colonel Robertson devoted a great deal of their time to Factory matters even going so far as to play the role of Sandwich Men, advertising sales of work along the length of Princes Street. The momentum was maintained into the Second World War but with a diminution of attractive artefacts. 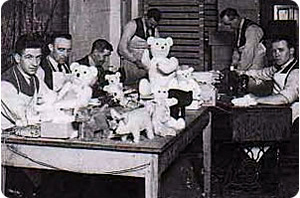 Instead, production focused on war goods such as gas mask holders, blackout blinds, lampshades, identity card holders, wallets and Red Cross collecting boxes. By the end of the war, over 100 men were still employed including a growing number of Second World War casualties.